Flint Expatriates: Shrinking Cities: Is the Grass Always Greener? 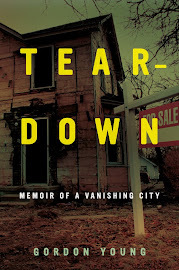 "As Flint tries to survive and thrive as a smaller city, the thousands of abandoned homes and vacant lots scattered throughout its neighborhoods are more than a reminder of its past as a manufacturing boomtown," writes David Runk of the Associated Press. "They're a costly headache to keep from getting wildly overgrown, with grass that can grow several feet high before being mowed. "Grass experts, sociologists and community leaders have teamed up on a three-year project to cut some of that grass and try to test the idea that maintained lawns and parks help revitalize neighborhoods. Lessons learned in Flint, they hope, could be used around the country. "'At one of the areas we're looking at, there's basically a park but no one is playing in it,' said Thom Nikolai, a Michigan State University turfgrass specialist who is leading the study. 'We want to come back in a year and see people throwing a Frisbee around.'" "Hmm...Frisbees as a measurement of urban vitality...I guess I can buy it. I'd rather have vegetables growing, cops on bikes, somebody playing a saxophone, Shakespeare in the park, kids cultivating something to compete with the Tree of Heaven. " 1. Criminal and socially deviant behavior. 25. Tall grass in parks and around abandoned properties. There are abandoned properties and unmaintained parks throughout Flint, of course, but a majority of Flint's area qualifies as having a Crime Problem, so it's valid to consider the importance of Tall Grass in comparison to Crime. It's not news to anyone that the same young people one might hope would be out playing Frisbee, alternately might be engaging in activities that are less socially desirable. That's particularly the case in neighborhoods where gangs provide the social focus for those young people. Playing Frisbee in the park is not a common gang activity. Parents in bad neighborhoods don't scrimp and save to buy their teen children computers and videogames in order to keep them in the house, so as to limit their exposure to tall grass. They do it to try to create an attractive alternative to street culture and gang membership, or simple innocent-bystander-is-shot status.